Champagne. There is no other name or phrase in the whole world of wine that can generate the same response as enunciation of that single word: ‘Champagne’. Thoughts of celebration, images of carefree bounty, success, romance, good fellowship all bubble to the surface at the mention of it, just as surely as the bubbles in the wine itself. In truth ‘Champagne’ is more than just the name of a sparkling wine made in a delimited region of France, from specified grapes and in keeping with various rules and regulations governing the method of production. The word ‘Champagne’ can be appended to just about any other to send out a message of luxury (‘Champagne breakfast’), decadence (‘Champagne lifestyle’) or celebration (‘Champagne reception’). No matter how hard other sparkling wines may try, they just cannot compete. ‘Sparkling wine lifestyle’ anyone? I thought not. It wasn’t always thus. Champagne was once a thin acidic wine with no bubbles at all and there is a fair body of evidence to suggest that it wasn’t the French but the English who first succeeded in making it sparkle. The English knew that if you added a little sugar to the wine it would induce a secondary fermentation and if you had a tightly sealed bottle that was strong enough to withstand the resultant pressure, the carbon dioxide gas would be dissolved into the wine. English bottles were stronger than French thanks to the fact that the glass was produced in coal-fired rather than wood-fired furnaces. Champagne was born. Since then layer upon layer of lustre and legend have been added to the story, elevating Champagne to the stoutly defended position that it holds today. The name itself is fiercely protected; just try using it to describe a product or service and see how quickly the legal boot boys from Reims come knocking on your door. Not only is it protected, it is assiduously promoted too. Unlike most French wine marketing, which might politely be described as patchy, that of Champagne is slick and successful. Over a period of many decades it has been elevated to iconic status and no matter how good other sparkling wines may be (and some of them are very good indeed) it still remains the undisputed king of bubbles. Reims Cathedral - with restoration work in progress on the left. Right at the heart of the Champagne region there is a greater, far greater, glory than even the finest bottle from the finest vintage: the cathedral of Reims. 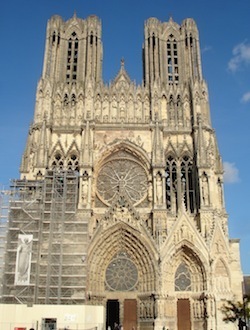 In a land that is fairly coming down with impressive ecclesiastical monuments (think Chartres, Notre Dame, Amiens…) Reims cathedral still manages to set the jaws dropping. Perhaps it is the fact that it played host to the coronation ceremonies of the kings of France for hundreds of years, perhaps the knowledge that it was nearly destroyed by shelling during the first world war. Whatever it is, no visit to the city is complete without a silent hour spent exploring its interior. Eschew the babble of the guided tour and give yourself over to the sheer splendour of the place. You can pick up all the facts and figures you may want later from a guidebook. Since the opening of the TGV line a couple of years ago Reims is now a mere 45-minute train journey from Paris, meaning that a day trip from the French capital is very feasible. Like most French cities the glorious centre is surrounded by a charmless concoction of semi-industrial buildings and apartment blocks. Get past that, however, and you will soon be wishing that you scheduled more than a day trip to the capital of the Champagne region. Irish people have great difficulty getting the pronunciation of this city’s name correct but it is simple really. Firstly, remember that it does not rhyme with ‘ream’. Secondly, just say ‘France’ but without the ‘F’, thus ‘Rance’. Give the ‘R’ a bit of ‘rrr’ and you might be mistaken for a native. Champagne bottles come in a bewildering number of sizes, from the miserly quarter-bottle, through the bottle and magnum right up to the whopping Nebuchadnezzar, equivalent in capacity to 20 standard bottles. Along the way they take in exotic Biblical names such as the Jeroboam (about the largest bottle that is produced in any sort of commercial quantity), the Rehoboam, Methuselah, Salmanazar and Balthazar. These large format bottles are wrapped in ‘cling wrap’ jackets for safety – to minimise the risk should they explode in the cellar. It hardly seems credible now but, in a textbook case of hubris gone mad, just a few years ago there was a proposal put forward that the boundaries of the Champagne region should be expanded so as to cope with, and cash in on, rampant world demand for the bubbly stuff. Shortly afterwards the world economy tumbled into the abyss from which it is still trying to extricate itself and the heated debate about whether expansion was a good thing or not cooled considerably. At one presentation it was stated that satellite imagery would be used to identify the most suitable vineyard sites to be granted the privilege of producing Champagne, prompting a slightly tongue-in-cheek enquiry from me about what might happen if they discovered that the Hunter Valley in Australia was the ideal spot. Haughty silence was the response. Don’t try this at home! You have seen it done in films, where a Cossack, or other heroic military gent armed with a sabre slices the top off a bottle of Champagne with practised ease. A good quantity of the contents ends up on the floor but in a big budget movie what’s a bottle or two between friends? If you absolutely must give this party trick a go then you need only arm yourself with a heavy carving knife and not a sabre. Strip all the foil and the wire muzzle off the bottle, find the ‘seam’ in the glass that runs up the side of the bottle, run the blade swiftly along this, blunt side first, and catch the lip of glass below the cork with a firm backhand swing. It works perfectly every time – in writing that is. With some negligible exceptions all Champagne is made from one or more of a trio of grapes: Chardonnay, Pinot Noir and Pinot Meunier. The first two are considered the aristocrats while Pinot Meunier, of which far more is planted than is talked about, brings up the rear as the workhorse. A blanc de bancs will be made exclusively from Chardonnay and a blanc de noirs will usually be made only from Pinot Noir, though some Meunier may be included. It is interesting to note that not very far south of Champagne, in Burgundy, Chardonnay and Pinot Noir are individually responsible for some of the greatest still wines in the world yet, when used to make Champagne, they yield something so completely different that it is difficult to believe it comes from the same grapes. The explanation lies in the fact that Champagne is perhaps the most ‘man made’ of wines, gaining far more of its character from manipulation in the winery than from viticultural practices in the vineyard. More than anything else it is the production process that gives Champagne its unique identity. Article originally published in Food & Wine Magazine, December 2011.